Eb Alto Lacquered Brass Body Nickel-Plated Keys Tilting G# - Bb Table Keys Metal Tone Boosters JAS710GN Student Eb Alto Saxophone Lacquer Lacquer. 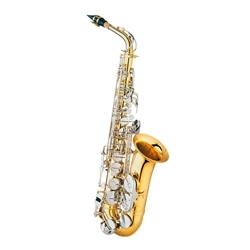 The Jupiter JAS710GN alto saxophone is a beginner to intermediate instrument with advanced features that will take a student through his or her secondary studies. It is built to withstand the rigors of student ownership, and has a satisfying sound and reliable, well-built mechanics. It comes with a quality wood frame case, mouthpiece and ligature.